STUDENTS from Mangotsfield School and neighbouring primary schools had the chance to meet members of The Cook Islands Rugby League players before the start of the World Cup. The team made Bristol its headquarters for the tournament, which opened on October 26 at the Millennium Stadium in Cardiff. The Cook Islands was in a group with the United States and Wales and played its first match at the Memorial Stadium in Bristol on October 30. A few days before, the team gave demonstrations and ran workshops at Mangotsfield School before leading an assembly for final year GCSE students. The Cook Islands are a collection of fifteen small islands in the Pacific Ocean between French Polynesia and American Samoa named after Captain James Cook, who landed there in 1773. The population of the Cooks is just 20,000. 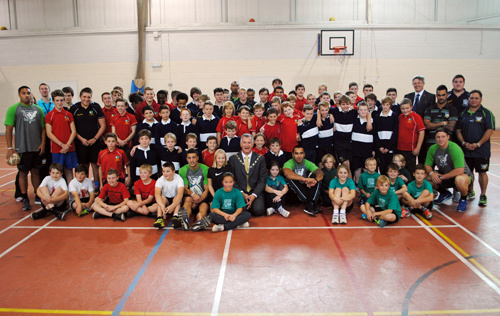 Mangotsfield School head teacher Richard Badley said, “We are really pleased to have inspiring international athletes meeting our students, not only through sport, but by sharing their culture and commitment to excellence. “The school is pleased that so many students choose to compete in competitive sports with local schools, regional competitions and, for some, on the national stage. The visit was organised by head of PE Gemma Shackleton and the visiting primary schools included Emersons Green and The Tynings.